Could you list a few high-interest books that you think could keep a Reader engaged for next year? I know everyone's tastes are different but I think shorter books are best for this challenge so you feel more accomplished and maybe something funny or an exciting mystery would be the thing to keep your brain engaged. I tend to pick lighter reads for this event. No Count of Monte Cristo for me! Do you have any suggestions for how to improve the Read-a-thon next season? I think things are going swimmingly.... it is such a great 24 hours and I always love it. What do you think worked really well in this year’s Read-a-thon? The mini challenges were easy but fun and I loved floating around checking Instagram and Litsy this time out.... the photos were fabulous! How many books did you read? I finished one and had two more in progress but read a total of 300 pages for the day... even with knocking off at hour 17 and having to leave the house three times for taxi runs. What were the names of the books you read? You are Forgiven by the Love God Greatly Group, Howard's End is on the Landing by Susan Hill, and I Wish He Had Come with Instructions by Mike Bechtle. 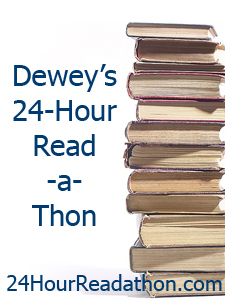 How likely are you to participate in the Read-a-thon again? What role would you be likely to take next time? Maybe a cheerleader or bring a mini challenge or I might be able to come with a prize. I will DEFINITELY be participating whenever my schedule allows!